A conditional agreement that could result in the construction of a manufacturing facility employing up to 25 workers in Limon was approved by the Board of Trustees at its Thursday, May 1 meeting. By unanimous vote, the town trustees approved Ordinance No. 574 permitting “the sale of certain nongovernmental real property within the Limon Golf Course Addition” to L. Kaufman International Holdings, LLC, a Colorado Limited Liability Corporation. That Longmont-based company plans to construct “a light manufacturing facility” at that location. 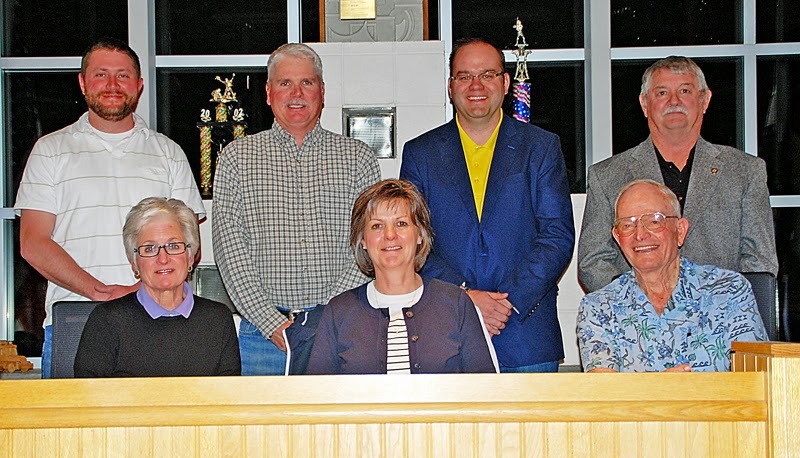 LIMON TOWN BOARD – The members of the 2014 Limon Board of Trustees are: (l-r) top row – Seth Metcalf, Jim Andersen, Jason Parmer and Jack Hendricks; bottom row – Linda Hawthorne, Mayor Julie Coonts and Del Beattie. Under the conditional agreement, the Town of Limon is selling a two-acre piece of property near the town’s shooting range in the Limon Golf Course Addition to L. Kaufman International Holdings. That company is also given the option of purchasing an additional 9.55 acres adjacent to the two acres at a later date. The town has agreed to sell the land for $5,000 per acre. Because the agreement is conditional, the board said it would accept a $1,000 earnest money deposit from the company. As explained during the meeting, the company’s plans to build the proposed manufacturing facility is still contingent upon the receipt of grant funding for which it has applied. The company needed the contract for the town’s property as part of its applications for three grants. “We should know within six to eight weeks if the grants have been approved,” Stone said. If the grants are not approved, L. Kaufman International Holdings may not go forward with the construction of the facility in Limon. Under the conditional agreement, the company can keep the property after full payment has been made. However, it does have the option of ending the agreement by returning the two acres to the town and having its money refunded. The type of products that would be manufactured at the proposed facility was not announced at Thursday’s meeting. The Town of Limon and Lincoln County Economic Development are excited to announce that a new business is planning to locate its manufacturing facility in the Town of Limon, Lincoln County. The light manufacturing facility will begin with 25 employees and is expected to grow in future years. A partnership of the Town of Limon, Lincoln County, Lincoln County Economic Development, Colorado Department of Local Affairs and Colorado Office of Economic Development are working with the business to bring this facility to Limon and Lincoln County. On Thursday, May 1,, 2014, the Limon Board of Trustees approved a Conditional Agreement for Purchase of Real Property for a two-acre site on the south end of the Limon Golf Course Addition to the Town of Limon. The conditional agreement also provides a one-year option on an additional 9.55 acres. This project would be the first major manufacturer to locate in Lincoln County. "This project has the opportunity to not only create the initial jobs but also to serve a catalyst for recruitment of additional manufacturing facilities to Limon and Lincoln County," said Limon Mayor Julie Coonts. "Let this public/private success serve as a call to all of Lincoln County and eastern plains, that the primary jobs we will gain in our county as a result will prove to be a benchmark for continued opportunities to generate much needed primary jobs, wealth, and other opportunities to build upon,” stated Lisa Nolder, Executive Director of Lincoln County Economic Development. “We are proof that rural Colorado is a viable place to do business. It always has been. But this is a direct result of hard work on behalf of the Town of Limon and Lincoln County. Well done. We should be proud." In other business at Thursday’s meeting, the town board approved a resolution to support an application for the establishment of a Foreign Trade Zone (FTZ). The Town of Limon will negotiate and prepare the application to be submitted to the Foreign Trade Zones Board of the U.S. government. As part of the resolution, a “service area” for the FTZ is designated that includes all of Adams, Arapahoe and Morgan counties, as well as portions of Lincoln, Elbert and Washington counties, including sites within the Town of Limon. In addition, the resolution identifies two “magnet sites” with the FTZ. These magnet sites are the “Big Sandy” property and East Limon Municipal Airport property. Other areas within the service area may be designated at a later time. The resolution also authorized Joe Kiely, Assistant Town Manager, to negotiate and prepare the FTZ application. In April 2013, the Town of Limon and Lincoln County jointly applied for the FTZ designation. The goal is to attract foreign businesses to the local area to set up distribution and manufacturing facilities. Merchandise within an FTZ is not subject to custom duties and excise taxes until it leaves the zone. In presenting the FTZ resolution, Stone said the formal application will be submitted to the federal government within the next 30 days, followed by a 90-day comment period. The entire process after that could take from six to 10 months. Stone said the good news in the FTZ application process is that so far the costs have been considerably less than first anticipated. Moving onto other business, the trustees approved a five-year extension of a lease of irrigation water rights to Fraiser Farms, which is assigning those rights to River Bend Ranch, LLC. The original lease with Frasier Farms for two town-owned wells was granted in 2004. The lease fee is for $7,332. The board also approved a two-year extension of its lease of classroom and office space in the west end of the Limon Memorial Library to Morgan Community College. The renewal of the lease included an adjustment of the fee charged. The original lease with the college was first approved in 2002. In another decision, the board gave Stone permission to negotiate the purchase of a rapid rate sand filter for the Limon Municipal Pool from Recreonics, Inc. The trustees stipulated the final purchase price must not exceed the $23,000 allowed for it in the town’s budget. Some of the board’s other decisions at Thursday’s meeting included the appointment of Brenda Tipton to a five-year term of office as a member of the Limon Housing Authority. The trustees also approved a liquor license renewal for Hoffman Drug. Also during Thursday’s meeting, the board listened to a presentation by Haselden Construction and Klipp Architects on the site plan for construction/renovation project planned for the Limon Public School. The groundbreaking ceremony has been set for 11:30 a.m. Wednesday, May 21. Demolition of the old elementary and middle school portions of the building are slated to begin in July. Site construction will begin in September with completion in July 2015. Final closeout is planned for October 1, 2015. During the staff and board member reports at the end of Thursday’s meeting, Stone said the recent Tamarack Golf Course Gala was successful and had raised about $8,000. He also talked about the use of town vehicles, the ongoing Transportation Enhancement Project on Main Street to install a concrete cover for the medians, and the installation of new sewer lines.